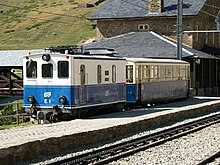 A mountain railway is a railway that operates in a mountainous region. It may operate through the mountains by following mountain valleys and tunneling beneath mountain passes, or it may climb a mountain to provide transport to and from the summit. Mountain railways often use narrow gauge tracks to allow for tight curves in the track and reduce tunnel size and structure gauge, and hence construction cost and effort. Where mountain railways need to climb steep gradients, they may use steep grade railway technology, or even operate as funicular railways. For railway lines named Mountain Line, see Mountain Line. Mt Morgan Rack Railway - abandoned in 1955. El Ferrocarril Trasandino Los Andes - Mendoza, Los Andes - Mendoza. The rebuild will be adhesion only. Rimutaka Incline Commenced operation in 1878 and ceased operation in 1955. View from Oraviţa - Anina railway in 2010. Apsheronsk narrow-gauge railway - located in the Krasnodar Krai, gauge of 750 mm (2 ft 5 1⁄2 in). Đà Lạt–Tháp Chàm Railway - Abandoned after the Vietnam War. The Culdee Fell Railway is featured in the book Mountain Engines, part of The Railway Series by Rev.W.Awdry. ^ "Unsere Geschichte: Von der Visp-Zermatt-Bahn bis zur BVZ Holding AG" (in German, French, and English). Brig, Switzerland: BVZ Holding AG. Retrieved 2017-07-03.